Insider threats, compromised accounts, and administrator abuse and misuse are among the most damaging and difficult to detect threats. User and entity behavior analytics (UEBA) solutions are making it possible to detect these advanced end user threats through the discovery of new trends and behavioral patterns within the environment. 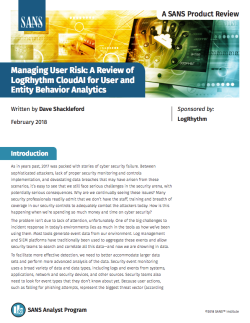 Download the review to see SANS' full analysis of LogRhythm CloudAI for User and Entity Behavior Analytics.